Turtle’s timely Facebook post on the 1939 hurricane went viral as Ophelia raged outside. It was liked and shared across the globe generating thousands of comments and emails. It proved three things. 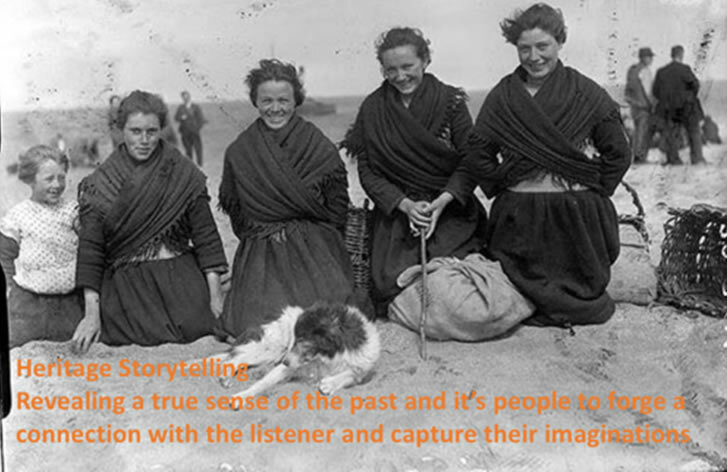 Firstly, people like stories they can relate to, that resonate with their lives and have personal meaning. Secondly, social media is a powerful tool for communicating stories and continuing the conversation with former visitors who are now friends and followers. Thirdly, no one can surpass our very own Turtle Bunbury when it comes to finding stories and crafting a compelling narrative. Enjoy the story below. The Night of the Big Wind was the most devastating storm ever recorded in Irish history. Known in As Gaeilge as ‘Oiche na Gaoithe Moire’, the hurricane of 6th and 7th January 1839 made more people homeless in a single night than all the sorry decades of eviction that followed it. The calm before the Big Wind struck was particularly eerie. Most of the eight million people living in Ireland at the time were preparing themselves for Little Christmas, the Feast of the Epiphany. The previous day had seen the first snowfall of the year; heavy enough for some to build snowmen. By contrast, Sunday morning was unusually warm, almost clammy, and yet the air was so still that, along the west coast, voices could be heard floating on the air between houses more than a mile apart. At approximately 3 o’clock in the afternoon, the rain began to fall and the wind picked up. Nobody could possibly have predicted that those first soft raindrops signified an advance assault from the most terrifying hurricane in human memory. By 6 o’clock, the winds had become strong and the raindrops were heavier, sleet-like, with occasional bursts of hail. Farmers grimaced as their hay-ricks and thatched roofs took a pounding. In the towns and villages, fires flickered and doors slammed. Church bells chimed and dogs began to whine. Fishermen turned their ears west; a distant, increasingly loud rumble could be heard upon the frothy horizon. At Glenosheen in County Cork, a well-to-do German farmer called Jacob Stuffle began to cry. At Moydrum Castle in County Westmeath, 78-year-old Lord Castlemaine decided to turn in early and go to bed. In the Wicklow Mountains, a team of geographic surveyors headed up by John O’Donovan, finally made it to their hotel in Glendalough; they had been walking all day, often knee-deep in snow. Sailing upon the Irish Sea, Captain Smyth of the Pennsylvania studied his instruments and tried to make sense of the fluctuating pressures. By 10 o’clock, Ireland was in the throes of a ferocious cyclone that would continue unabated until 6 o’clock in the morning. The hurricane had roared across 3000 miles of unbroken, island-free Atlantic Ocean, gathering momentum every second. It hit Ireland’s west coast with such power that the waves actually broke over the top of the Cliffs of Moher. Reading contemporary accounts, the impression is that if Ireland did not have such magnificent cliffs forming a barrier along our west coast, the entire country would simply have been engulfed by water. The noise of the sea crashing against the rocks could be heard for miles inland, above the roar and din of the storm itself. The earth trembled under the assault; the ocean tossed huge boulders onto the cliff-tops of the Aran Islands. All across the country, hundreds of thousands of people awoke to the sound of the furious tempest, their windows shattered by hailstones, their brick-walls rattling, their rain-sodden thatched roofs sinking fast. As the wind grew stronger, it began to rip the roofs off houses. Chimney pots, broken slates, sheets of lead and shards of glass were hurtled to the ground. Rather astonishingly, someone later produced a statistic that 4,846 chimneys were knocked off their perches during the Night of the Big Wind. Many of those who died that night were killed by falling masonry. Norman tower houses and old churches collapsed. Factories and barracks were destroyed. Fires erupted in the streets of Castlebar, Athlone and Dublin. The wind blew all the water out of the canal at Tuam. It knocked a pinnacle off Carlow Cathedral and a tower off Carlow Castle. Gables tumbled from the cathedral in Trim and the Bishop’s Palace on the Rock of Cashel also; the remains of the latter can still be seen on the great lawn.It stripped the earth alongside the River Boyne, exposing the bones of soldiers killed in the famous battle 150 years earlier. Roads in every parish became impassable. All along the Grand Canal, trees were pulled up by the roots and hurled across the water to the opposite bank.Thousands of timber cabins were destroyed by the storm. Surviving inhabitants had no choice but to flee into the pitch-black night in clothes that were presumably soon utterly drenched by the intense rains and snows which accompanied that cruel, piercing wind. Many sought shelter amid the hollows and hedges of the land. Farmers were hit particularly hard. Hay-ricks in fields across Ireland were blown to pieces. Wooden fences and dry-stone walls collapsed, allowing fearful livestock to run away. Sheep were blown off mountains or killed by tumbling rocks. Cattle were reported to have simply frozen to death in the fields. Stuffle was not the only man who believed the hurricane, occurring on the night of the Epiphany, was of Divine origin. Many saw it as a warning that the Day of Judgment would soon be here. Some believed the Freemasons had unleashed the Devil from the Gates of Hell and failed to get him back in again. Others maintained this was simply the night the English fairies invaded Ireland and forced our indigenous Little People to disappear amid a ferocious whirlwind. (Irish fairies, of course, are wingless and can only fly by calling up the sidhe chora – the magic whirlwinds). The well-to-do did not escape; many mansions had their roofs stripped off. Lord Castlemaine was fastening his bedroom window when the storm blew the windows open and hurled him ‘so violently upon his back that he instantly expired’. His brother-in-law, the Earl of Clancarty, later reported the loss of nearly 20,000 trees on his estate at Ballinasloe. Similar figures came in from other landed estates in every county; one landlord declared his woods were now ‘as bald as the palm of my hand’. At the Seaforde estate in County Down, an estimated 60,000 trees were lost. The Lord Bishop of Meath’s demesne at Ardbraccan House was likewise devastated. On January 6th 1839, timber was a valuable commodity. 24 hours later, so many trees had fallen that timber was virtually worthless. Millions of wild birds were killed, their nesting places smashed and there was no birdsong that spring. Even crows and jackdaws were on the verge of extinction.Fish were lifted from the lake at Farnham, County Cavan, and scattered across the fields of Farnham estate; stories would later be told of seafish found in the Slieve Blooms. Dublin resembled ‘a sacked city …the whirlwind of desolation spared neither building, tree nor shrub’. The Liffey rose by several feet and overflowed the quay walls. The elms that graced the main thoroughfare of the Phoenix Park were completely levelled, as were the elms at the Royal Hospital Kilmainham. At the Viceregal Lodge (now Áras an Uachtaráin), a tree crashed through the roof of the guardroom where soldiers had been conversing just moments earlier. The trees on Leinster Lawn outside the present-day Dail were uprooted and scattered ‘like prostrate giants on their mother earth’. The back wall of the Guinness Brewery collapsed killing ‘nine fine horses’. A witness next morning described how ‘the noble animals [were] stretched everywhere as if sleeping, but with every bone crushed by the ponderous weight of the wall’. Military sentry boxes were blown off their stands and ‘scattered like atoms’. A glass shop on Nassau Street became ‘a heap of ruins’. On Clare Street, a chimney collapsed on a woman who had only just got into her bed, killing her instantly. Police stations and churches opened the door for thousands of terrified citizens who brought their young and frail in for protection. Even churches could not be trusted on this night of Lucifer. The steeple of Irishtown chapel caved in and the bell from the spire of St Patrick’s Cathedral came down like a meteorite; mercifully nobody died in either instance. Phibsborough Road was a bombsite of exploded windows and fallen chimneys ‘as if by shot and shell’. One of the 40 female inmates at the Bethesda Penitentiary on the north-side (where the National Wax Museum formerly stood) took the opportunity to ignite a fire that destroyed the building as well as the surrounding houses, school-house and chapel. Two firemen died trying to extinguish the flames. The hurricane did not stop in Dublin. It pounded its way across the Irish Sea, killing hundreds of luckless souls caught at sea. It killed nearly 100 fishermen off the coast of Skerries. It killed Captain Smyth and the 30 people on board the packet-ship Pennsylvania. Ships all along the west coast of England were wrecked; dead bodies continued to wash up onshore for weeks afterwards. At Everton, the same wind unroofed a cotton factory that whitened all the space for miles around, ‘as if there had been a heavy fall of snow’. Estimates as to just how many died that night vary from 300 to 800, a remarkably low figure given the ferocity of the storm. Many more must have succumbed to pneumonia, frostbite or plain old depression in its wake. Those bankrupted by the disaster included hundreds who had stashed their life savings up chimneys and in thatched roofs that disappeared in the night. Even in those days it was ‘an ill wind that turned none to good’ and among those to benefit were the builders, carpenters, slaters and thatchers who subsequently rebuilt the fallen buildings. The Big Wind also inspired the Rev Romney Robinson of the Armagh Observatory to invent his world-famous Robinson Cup-anemometer, the standard instrument for gauging wind speed for the rest of the 19th century.